This is the letter Rachel Slabaugh sent to the Camdenton High School principal. WAYNESVILLE, Mo. (Oct. 24, 2015) — Waynesville R-VI School District officials have released an official statement in response to allegations that fans of the Camdenton High School football team used racial slurs at Friday's night's Camdenton-Waynesville football game. The incident came to public attention when Rachel Slabaugh, a Waynesville High School Tiger Pride Band member, sent a letter to the Camdenton principal, posted it on her Facebook page, and that letter was re-posted by recently elected Waynesville R-VI School Board member Paul Shultz. According to Slabaugh, "many students (and adults) representing your school chose this time to scream rude comments, obscenities, and racial slurs at our band." Waynesville Superintendent Brian Henry, who served for many years in the Camdenton district before accepting an assistant superintendent position in Waynesville and then being promoted to the top superintendent position following the retirement of former superintendent Judene Blackburn, issued a statement Saturday afternoon stating that Waynesville officials have been in contact with their Camdenton colleagues. 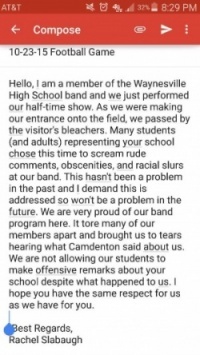 "The Waynesville R-VI School District is aware that Waynesville students have contacted the Camdenton High School principal regarding alleged comments that were made to the Waynesville High School Marching Band during half time of the Waynesville vs. Camdenton varsity football game Friday night," according to the statement. "We take allegations of this nature seriously and have been in contact with Camdenton school officials," Henry said in the statement. "They have assured us that the alleged behavior is not tolerated and they will fully investigate the situation and will assess appropriate consequences." The Waynesville High School principal, Courtney Long, "will also meet with band members on Monday to provide them with an opportunity to discuss the situation," according to the official statement. Click here for comments and local opinion. Click here for discussion of Rachel Slabaugh's original email to Camdenton principal.